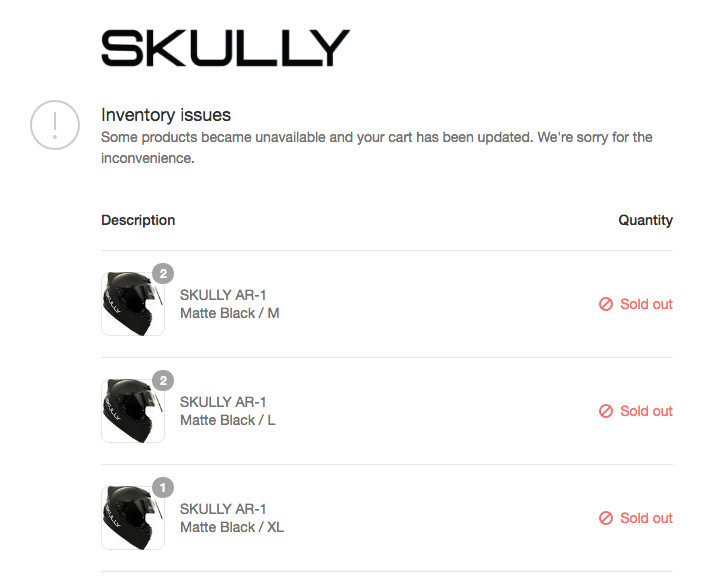 The site is still up for now but it says Skully’s AR-1 helmet is sold out in every size and no one is able to order. A source tells us sales were cut off on Monday. The shutdown leaves several vendors and Skully’s manufacturer Flextronics with unpaid bills and at least 50 full-time employees out of a job. It’s unclear if any of the vendors will be paid. According to a source, Weller botched a possible acquisition deal with Chinese company LeSports before leaving the company last week. Another source inside the company said at the time Weller did not ruin the relationship with LeSports and that the deal might still happen now that the former CEO was out of the picture. However, Weller counters that story, telling TechCrunch he and his brother were forced out of the company after investors disagreed with the LeSports deal he brought to the table, opting instead for an inside round. Another source familiar with the matter confirms his story that he brought in the LeSports deal but said Skully was rapidly running out of cash and it was down to the eleventh hour determining if the numbers added up. Adding to that, we’ve been told the board thought Weller has been so difficult to deal with since leaving, they now don’t see the point in salvaging the company he started. We’re told by a source inside the company that as of Monday, investors from Intel Capital determined it was better to just shut the whole company down instead. Intel Capital denies that claim, saying it tried to save the company up until the end. “We have 100% confidence in our delivery schedule and will continue to keep you in the loop. Please stay tuned because we have very exciting announcements coming up,” read the email. But the hardware company now only adds to the heap of carnage starting to pile up in Silicon Valley. Shuddle, the Uber for kids, hit the brakes in April, Buffer and General Assembly both chopped a bunch of staff last week and Zenefits took a tumble earlier this year, letting go of roughly 250 staffers as part of a course correction after ousting Parker Conrad. Much of the upheaval is likely due to overgrowth issues in an increasingly tight VC market. However, Skully’s demise seems to stem from one part manufacturing hiccup, which slowed shipment of the product, and a big dash of overblown egos, ultimately leading to its demise. Weller was gutted at the news. He said he had not heard the company he’d started was shutting down before we’d reached out to him. When asked what he was going to do next he told us he was not sure. Update: though it seems an official shut down looms imminent, some within the leadership are holding out hope still. “The SKULLY executive team is working diligently on closing a round of funding so that we can continue to fulfill our pre-orders and delight our customers,” marketing VP Carlos Rodriguez told TechCrunch late Tuesday night. Is it possible things could turn around? Signs point to no from many whom TechCrunch spoke to close to the company. We should also add this same executive team told us earlier that Intel Capital would be adding to the round. Intel told us that was not true. But maybe Skully can turn things around right before the lights officially go out like they say they are trying to. This is Silicon Valley. Miracles do happen. For the customers and employees affected by this mess, we sincerely hope there’s at least some sort of life preserver for them.